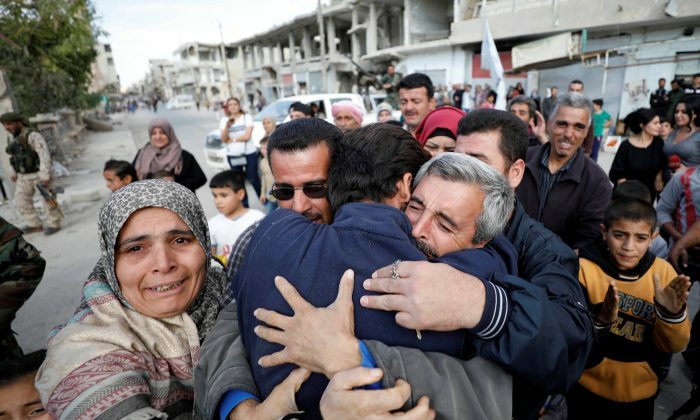 QARYATAYN, Syria—Twenty-six Syrian hostages who escaped from their ISIS captors received an emotional homecoming on Oct. 29 in the central province of Homs, witnesses and officials said. They were among at least 70 people abducted and taken by fleeing ISIS terrorists to a secret location in the desert east of the town of al-Qaryatayn when the Syrian army and pro-government militias regained control of the town on Oct. 21. The others are still missing, according to local officials, who have not disclosed the identities of any of the hostages. Al-Qaryatayn lies nearly 190 miles (300 kilometers) west of Deir al-Zor city, the current focus of Syrian President Bashar al-Assad’s forces, with Russian jets and Iran-backed militias, in their offensive against ISIS. 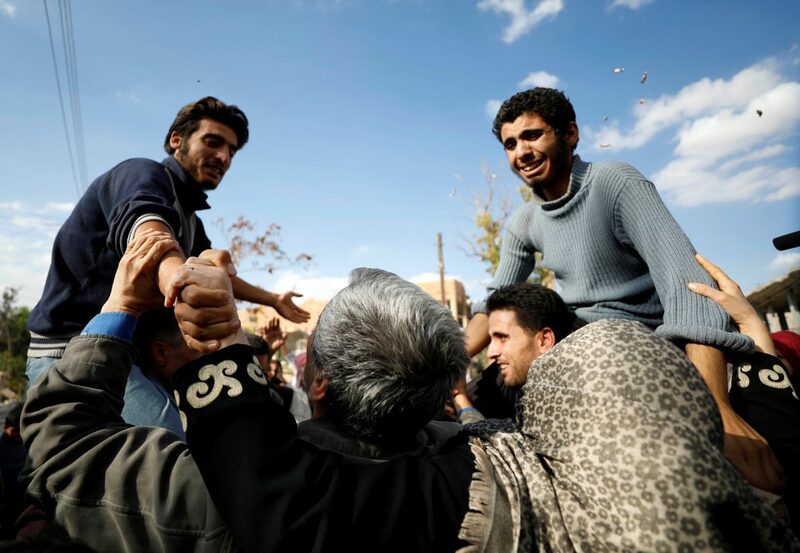 About 200 people turned out in al-Qaryatayn on Oct. 29 to welcome home the returning hostages, according to Reuters reporters who visited the war-scarred town during a trip organized by the Syrian authorities. 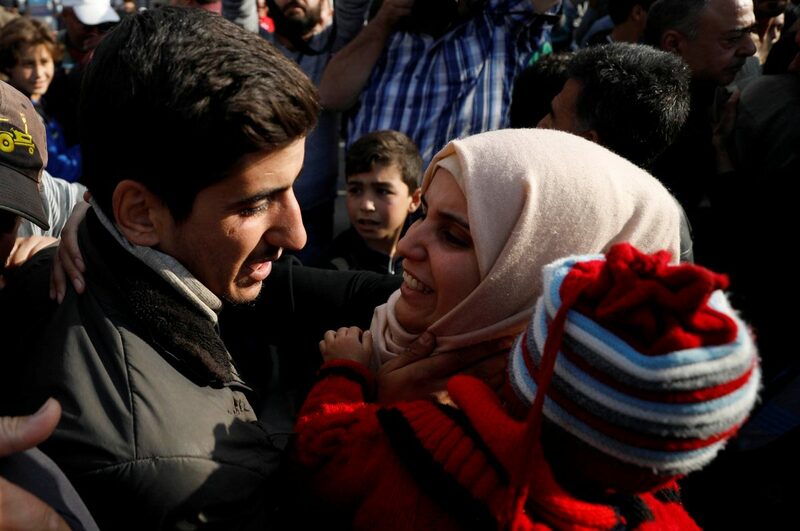 Parents wept as they embraced returning sons while other relatives and local residents threw sweets and sugar in the air in celebration. “Thank God for your return,” said an elderly man as he embraced a young man. Most in the crowd declined to be interviewed. 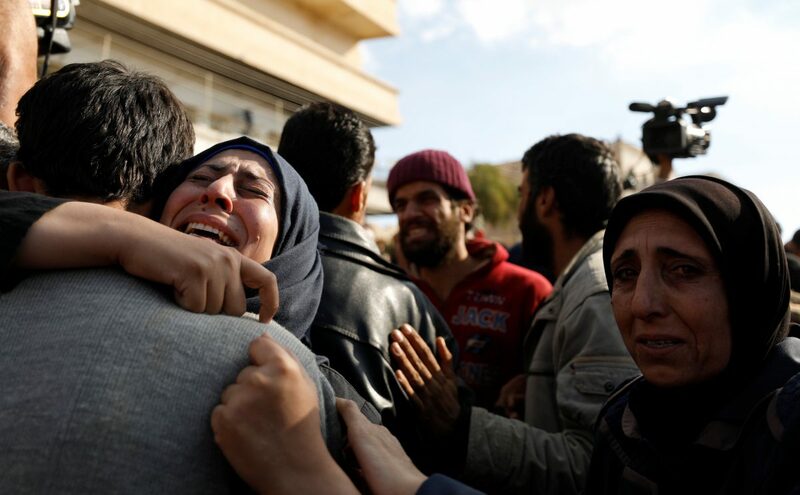 Syrian authorities said jihadists had taken revenge after being forced out after three weeks of fighting around the outskirts of al-Qaryatayn, by slaughtering scores of the city’s inhabitants. A senior local official said the hostages escaped after they got past an Iraqi jihadist militant while he took a nap and seized his gun and shot him dead. But the joy surrounding the hostages’ return was still overshadowed by executions witnessed in the town in the past few weeks when terrorists rounded up local officials and members of the security forces, police and members of their families and executed them in broad daylight, according to officials. “We forgot our joy when thinking of the nightmare that we went through,” Found Ghosn, a local government official told Reuters TV, saying city officials had identified at least 70 out of 130 people slain during the revenge killings.